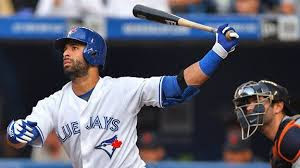 TORONTO - Ross Atkins (Blue Jays GM) has stated in an interview that he will meet with slugger Jose Bautista this week to discuss a contract extension. Bautista's contract ends after the 2016 season. The 35 year old will earn $14M this year. His numbers were impressive for 2015, 250/.377/.536 with 40 homers and 114 RBI over 153 games.